Here are the discussion questions that accompany my message, “Singing the Songs of God’s Salvation,” from this past weekend at Eastbrook Church. 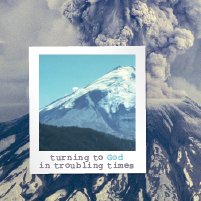 This is the fifth and final part of our series, “Turning to God in Troubling Times,” from the book of Habakkuk. This week we looked at Habakkuk 3:1-19. What sorts of things have lifted your spirits when you have gone through troubling times? Why? This weekend we conclude our series from the book of Habakkuk, “Turning to God in Troubling Times,” by studying Habakkuk 3:1-19. This closing prayer to God full of rich imagery and declarations of faith. Before you read the passage aloud, ask God to clearly speak to you. Verses 1-2 show a change of tone in Habakkuk from the previous two chapters. How would you describe Habakkuk’s tone in prayer before God in chapters 1 and 2 as compared with these first two verses of chapter 3? With verses 3-15, we see Habakkuk mingling together reflections on what God has done in the past and what He will do in the days to come. There are many references to the exodus of Israel from Egypt during Moses’ time in these verses. Take a moment to search out references to the Exodus that are found here, particularly in verses 3-7. Why do you think the Exodus imagery was important for Habakkuk in his day and time? What could it convey? Beginning in verse 8, Habakkuk depicts God as a warrior. What descriptors of God show His might and power as a warrior here in verses 8-15? Given the pending judgment God outlined in chapters 1 and 2, why might this picture of God speak powerfully to Habakkuk and his hearers? In the midst of these words about God’s past and future deliverance, Habakkuk mentions the ‘anointed one’ (Hebrew: messiah) in verse 13. Often the Messiah was a reference to a king or ruler. This is one of the clearest references to the Messiah as a person who will bring deliverance and will be delivered by God. Why would Habakkuk be looking for a Messiah in the circumstances of his day? With verse 16, we read Habakkuk’s final words in this psalm to God. The Hebrew word for ‘trembling’ appears twice in this verse (NIV: ‘my heart pounded’ and ‘my legs trembled’). Why do you think Habakkuk is trembling, even as he waits patiently? The last three verses (17-19) reveal a deep faith in troubling times. The fig tree, grapes, and olives are luxuries of the land, while the fields, sheep, and cattle are essentials for life in the land. What sort of faith declaration is Habakkuk making in light of what we read here? Have you endured a time of great trouble? How have you learned to rejoice and trust God in the midst of that season of life like Habakkuk? As we draw this series to a close, take a moment to reflect on some of the ways God has been speaking to you through Habakkuk’s message. If you are with a small group, discuss that with one another and pray for one another. If you are studying on your own, write it down and share it with someone.